On Jan. 3, President Obama signed the Pipeline Safety, Regulatory Certainty, and Job Creation Act of 2011 (2011 Act) (H.R. 2845, Public Law 112-90, 125 Stat. 1904). The 2011 Act significantly amended existing pipeline safety laws and authorized the appropriation of funds to support the pipeline safety activities of the Pipeline and Hazardous Materials Administration (PHMSA) through 2015. Many of the amendments were in response to high-profile pipeline accidents in 2010 and early 2011 that caused Congress to conclude that tougher requirements are or may be needed to ensure the safety of the nation’s 2.4 million miles of pipeline infrastructure. In July 2010, a hazardous liquid pipeline ruptured near Marshal, MI releasing an estimated 819,000 gallons of crude oil into the environment, including the local creek and downstream river. The incident raised concerns about the effectiveness of PHMSA’s integrity management (IM) regulations for hazardous liquid pipelines and the ability of operators to effectively detect and stop the discharge of hazardous liquid following a rupture. In September 2010, a gas transmission line ruptured in San Bruno, CA resulting in multiple fatalities and extensive property damage. The incident raised a number of issues regarding PHMSA’s safety regulations for gas transmission pipelines, including the effectiveness of PHMSA’s IM regulations, the ability of operators to stop the flow of gas during a rupture, and the accuracy of records regarding the physical and operational characteristics of buried transmission pipelines. The 2011 Act affects operators of all types of facilities and requires that PHMSA re-examine many of its regulations, and - as appropriate - revise, expand, and strengthen them. Key provisions affecting hazardous liquid and gas pipelines address the possible expansion of IM requirements, establishment of standards for leak detection systems, expanded use of automatic or remote controlled valves, and the verification of gas pipeline records, including those in support of maximum allowable operating pressure (MAOP). Even before the passage of the 2011 Act, PHMSA was considering these and other issues and had begun comprehensive reviews of its regulations. In two Advance Notices of Proposed Rulemaking (ANPRM), PHMSA sought public comment on the appropriateness of numerous changes to gas and hazardous liquid safety regulations. These ANPRMs will likely lead to stronger pipeline safety regulations. This article examines how the 2011 Act might affect some of the regulatory initiatives addressed in those ANPRMs. PHMSA’s IM regulations, adopted in 2000 for hazardous liquid pipelines and 2003 for gas transmission pipelines, require operators to implement heightened safety measures for certain pipelines. Pipelines must develop and implement written plans describing how the operator identifies threats, assesses the risks associated with those threats, mitigates that risk through remediation and repairs, and implements ongoing preventive measures. For liquid IM, operators must implement these measures on pipelines that could affect certain areas (known as high consequence areas (HCAs)). HCAs for liquid lines include commercially navigable waterways, certain populated areas, and drinking water and ecological resource areas. For gas IM, operators must implement heightened measures on pipelines that fall within HCAs. An HCA for a gas pipeline is an area near the pipeline that contains several buildings or areas intended for human occupancy. Both the gas and hazardous liquid ANPRMs address IM. In its 2010 hazardous liquid ANPRM, PHMSA stated that it is considering whether additional measures are needed to increase safety for pipelines that could not affect HCA areas. In particular, PHMSA is considering whether IM requirements should be a model for adding safety measures for such pipelines, whether to increase the miles of pipeline subject to IM requirements by expanding the definition of an HCA, and whether to expand IM repair criteria to pipe located in non-HCA areas. In PHMSA’s 2011 gas ANPRM, the agency posed numerous questions on whether IM requirements for gas transmission lines should be clarified, revised, or strengthened. Topics on which PHMSA sought comment included requirements for collecting, validating, and integrating pipeline data, the selection and use of assessment methods, applying knowledge gained, modifying repair criteria, and requirements related to preventive and mitigative measures. The 2011 Act requires that PHMSA evaluate whether to expand IM requirements to additional areas, taking into consideration a number of specified factors, and submit a report to Congress. If PHMSA finds that expanding IM regulations is appropriate, then it must issue final regulations implementing such expansion. For gas transmission pipelines, the Act contains the additional requirement that PHMSA consider whether such an expansion would mitigate the need for class location requirements. PHMSA must complete its evaluation by July 3, 2013, and submit its report to Congress by Jan. 3, 2014. PHMSA is prohibited from issuing final regulations until one year after completing the report (July 3, 2014) or Jan. 3, 2015, unless PHMSA determines that a risk to public safety, property or the environment is present, or that an imminent hazard exists. Impact of the 2011 Act. Despite the urgency for pipeline safety reform that infused the congressional debate during the reauthorization process, the 2011 Act requires that PHMSA postpone for at least two years issuance of final regulations, if any, that would expand the scope of the IM regulations. First PHMSA must evaluate the issue and submit a report to Congress. PHMSA can issue final regulations expanding the scope of IM earlier only if it finds the existence of a risk to public safety, property, or the environment or an imminent hazard. While PHMSA has received a substantial number of comments in response to the ANPRMs, it is not clear the information gathered is sufficient to enable PHMSA to perform the required evaluation. PHMSA may have to initiate additional proceedings to obtain more information and data. Despite the mandated delay, however, the statute does not prohibit PHMSA from strengthening IM programs within their current scope, or proposing rules that could later lead to final rules expanding IM. PHMSA’s ANPRMs also address leak detection systems and the increased and improved use of emergency flow restriction devices (EFRD) (i.e., check valves or remotely controlled valves) on hazardous liquids pipelines, as well as the spacing of block valves and the use of automatic or remote-controlled valves for gas transmission pipelines. Current regulations require that operators of hazardous liquid pipelines have measures in place to detect leaks on pipelines that could affect HCAs and evaluate and modify their leak detection systems to ensure they protect HCAs. PHMSA’s regulations also require that operators install valves in order to minimize harm from accidental discharges and specifically require installation of valves at certain locations, such as water crossings more than 100 feet wide and on each side of a reservoir holding water for human consumption. PHMSA is considering whether to increase and improve the use of leak detection on hazardous liquid pipelines by establishing or adopting standards and procedures for minimum leak detection requirements for all liquids pipelines. PHMSA also seeks to increase and improve the use of EFRDs and is considering whether to require them in certain areas or provide additional guidance on installing them in optimum locations. On gas pipelines, current regulations require minimum block valve spacing and more frequently spaced valves in populated areas, and suggest, but do not require, the use of automatic or remote-controlled valves. PHMSA’s gas ANPRM sought comment on whether these existing requirements are sufficient to promptly isolate sections of gas transmission lines after an incident. Under the 2011 Act, PHMSA must submit a report to Congress on leak detection systems used on hazardous liquid pipeline facilities and transportation-related flow lines, and analyze technical limitations on current leak detection systems, the practicability of establishing technically, operationally, and economically feasible standards, and the safety benefits and adverse consequences of requiring leak detection systems. Where practicable, PHMSA must issue regulations requiring leak detection systems on hazardous liquid pipelines and establish technically, operationally and economically feasible standards for such systems. PHMSA’s report to Congress is due Jan. 3, 2013, and PHMSA is prohibited from issuing final regulations until one year after completing the report or until Jan. 3, 2014, unless PHMSA determines that a risk to public safety, property or the environment is present, or that an imminent hazard exists. The 2011 Act also requires that PHMSA issue, if appropriate, regulations requiring the use of remote or automatic shut-off valves, or equivalent technology, on new or entirely replaced gas and hazardous liquid transmission lines where economically, technically and operationally feasible. If PHMSA decides to issue regulations, they are required by Jan. 3, 2014. Impact of the 2011 Act. As with the IM provisions, the 2011 Act requires that PHMSA postpone for at least two years issuance of final regulations that would establish standards for leak detection systems. First PHMSA must perform studies and submit reports to Congress. PHMSA can issue final regulations earlier only if it finds the existence of a risk to public safety, property, or the environment or an imminent hazard. The 2011 Act does not, however, mandate any delay with respect to automatic and remote-controlled shut-off valves, and the new legislation would appear to have little impact on PHMSA’s ability to issue regulations requiring such valves. The Jan. 3, 2014 statutory deadline for issuing valve regulations, if appropriate, provides a level of accountability to Congress. More than half of the nation’s gas pipeline infrastructure was constructed before 1970 when the minimum federal pipeline safety standards, including pressure testing requirements, were first adopted. Pipeline safety regulations allow certain regulatory exemptions for such pre-1970 pipelines. These pipelines are exempted from the requirements limiting MAOP to 72% SMYS and post-construction hydrostatic pressure testing. The resulting “grandfather clause” permits operators to establish MAOP based on highest actual operating pressure to which the line was subjected during the five years preceding July 1, 1970, as reflected in a pipeline’s records. The San Bruno incident occurred on a line constructed before 1970. As the accident investigation unfolded, it became clear that the operator’s records did not accurately describe the physical characteristics of the ruptured pipe. The operator’s records indicated that the line was seamless, when in fact, the line had a longitudinal seam. As a consequence, the incident raised concerns about the accuracy and completeness of pipeline records and, more generally for the pipeline industry, the validity of pipeline MAOP. PHMSA has responded to these concerns. First, in response to a recommendation of the National Transportation Safety Board following the San Bruno incident, PHMSA issued an advisory bulletin addressing MAOP and pipeline record keeping. The bulletin stated that, for pipelines whose MAOP is based on a review of design, construction, inspection, testing and other related data, operators must ensure that such records are traceable, verifiable, and complete. The advisory bulletin stated that, if an operator cannot perform such verification, then it could not use this method to establish MAOP. The advisory bulletin also stated that operators must examine pipeline infrastructure records to ensure that they accurately reflect the pipeline’s physical and operational characteristics, and indicated that such records also must be traceable, verifiable and complete. In addition, in its ANPRM for gas transmission lines, PHMSA has stated that it is considering eliminating the grandfather clause and has requested public comments on removing it from the federal safety regulations. The 2011 Act also addresses records accuracy and MAOP validation. Under the Act, PHMSA must require owners or operators of intrastate and interstate gas transmission lines to verify (pursuant to elements determined by PHMSA) that records for gas transmission pipe in Class 3 and 4 locations and Class 1 and 2 HCAs reflect the physical and operational characteristics of the pipeline and confirm the established MAOP. If records for a pipeline segment are insufficient to confirm the established MAOP, the pipeline operator must submit documentation on the segment to PHMSA. 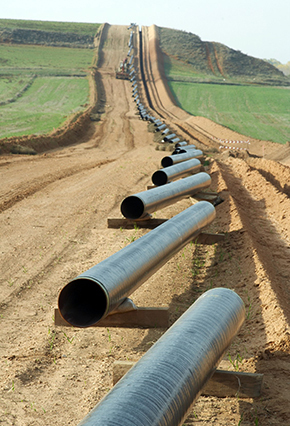 Pipeline operators also must report to PHMSA and appropriate State authorities any exceedances of MAOP that are greater than the buildup allowed for operation of pressure-limiting or control devices. For lines with records that are insufficient to confirm the established MAOP, PHMSA must (1) require the owner or operator to reconfirm MAOP as expeditiously and economically feasible; and (2) determine appropriate interim actions for the pipeline owner or operator to take until MAOP is confirmed. PHMSA also is required to issue regulations for conducting tests to confirm the material strength of gas transmission lines in HCAs that previously were not tested and that operate above 30% SMYS. In developing regulations, PHMSA must consider pressure testing, and other alternative methods, including in-line inspection, determined by PHMSA to be of equal or greater effectiveness. Finally, PHMSA must consult with the Federal Energy Regulatory Commission to establish timeframes for completing such testing that account for potential consequences to public safety and the environment and that minimize costs and service disruptions. The 2011 Act does not directly address the MAOP grandfather clause, but it effectively and significantly limits its applicability through the new requirement that DOT promulgate testing regulations for previously untested transmission lines in HCAs operating above 30% SMYS. The records and MAOP verification provision follow the theme announced in PHMSA’s 2011 advisory bulletin, but, importantly, do not codify the traceable, verifiable and complete standard or any other standard. PHMSA is expected to issue guidance this year on the elements necessary to conduct an appropriate records verification.